From the famous chef Marx, here is a recipe of ‘tartine’ that i modified a little and another one. 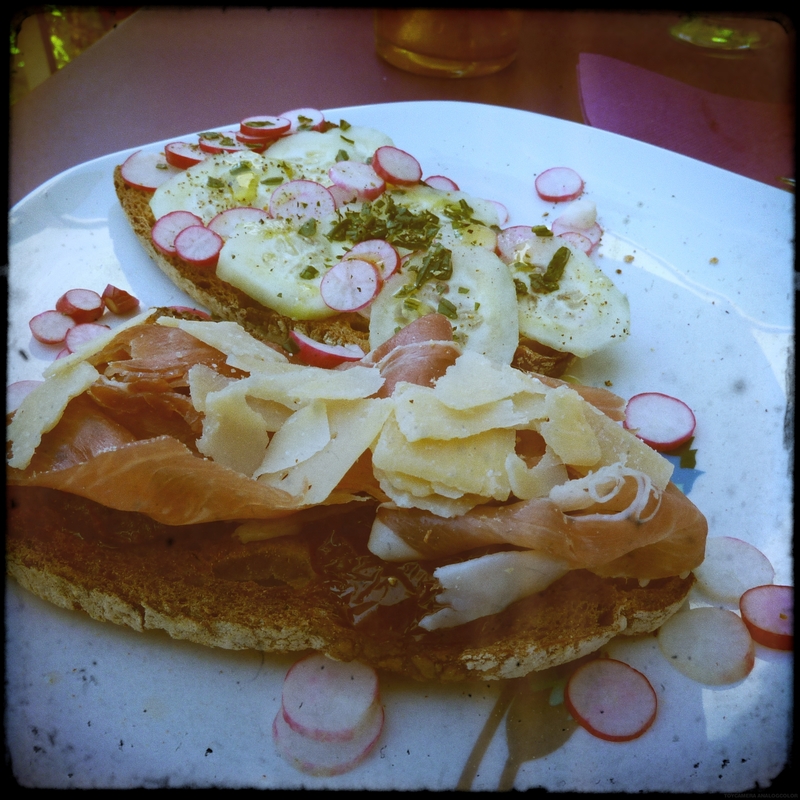 Quick, simple and healthy= Perfect for summer! 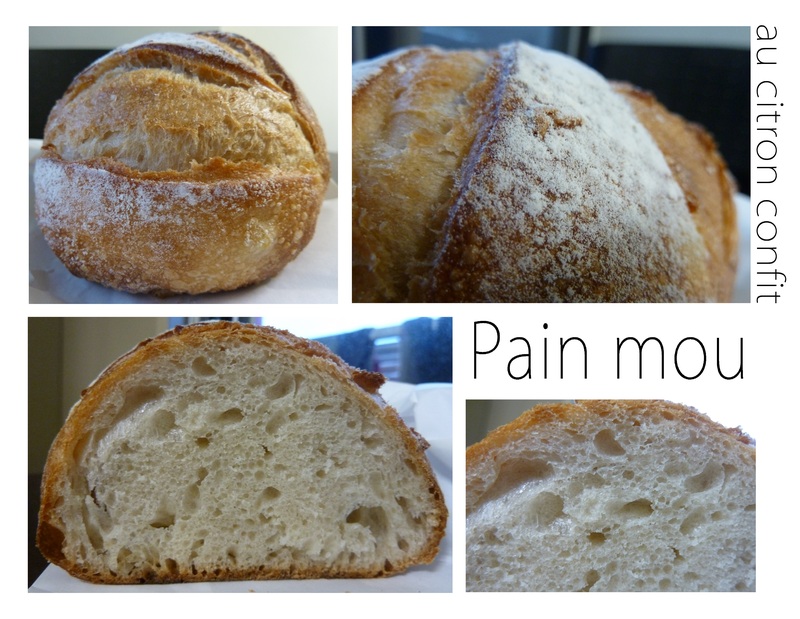 You can have 2 ways of cooking your bread: just roast it in the oven 3 mn, or fry it a little in some butter in a pan. Cut your cuncumber and your radish in really thin slices. Put on your bread nicely, add some salt, pepper, olive oil and chive. Cook your bread as said above. Put some dried tomatoes, ham, parmesan and cover with little olive oil and pepper (you shouldn’t need salt since the cheese and the ham are already quite salty). I have always wondered why the world think that bread is unhealthy. I mean, it’s only flour, water, yeast and salt, how is that can be bad? But then, after coming to Taiwan, i understood why they say that. Actually, in most Asian countries it’s also the same: the definition of bread is totally different. In France, according to the dictionnary, bread is: a food resulting from the cooking of a kneaded dough made of flour, salt, water and subjected to fermentation with yeast. While in Asia, it seems that bread is everything that you can find in a bakery, including bun, croissants and other viennoiseries, all products, thus those made with butter. So for sure, the definition of “bread” in Asia is unhealthy. The first time when i was working and for lunch, everyone was asking for “breads” but came back with bum or viennoiseries, i didn’t understood. Actually in Taiwan, you have only two categories: cakes and breads, nothing else. 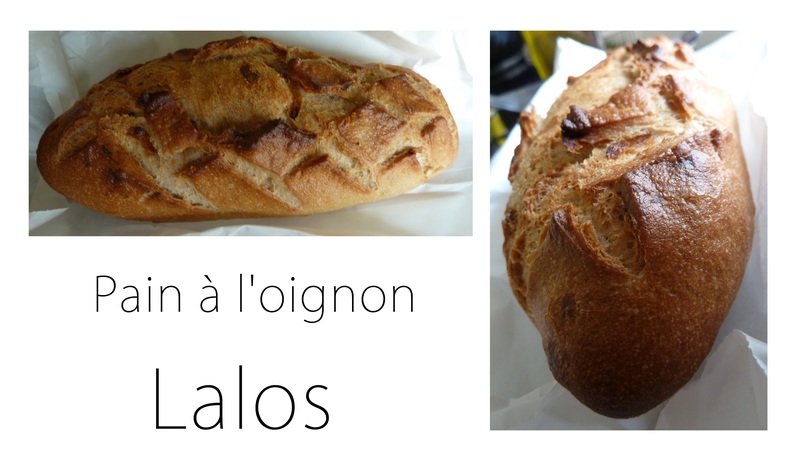 They also don’t see the difference in terms of unhealthiness between real bread and viennoiries and buns. And since they don’t like crispy and hard bread, they will naturally choose butter, milk or sweet “breads”. Differences of culture. While in France we usually like our bread well cooked and crispy, here you have a lot of buns, milky loaf bread, nearly uncooked and totally white breads, and a lot of flavored breads, like red wine and cheese bread, banana chocolate bread, chicken curry, maple sirup…they look like actual bread, but they’re not crispy. The shape is also different. in Taiwan bread are smaller, usually for 1 person, rounder and thicker, like 2 times thicker than in France. That’s because of the filling (cheese, bacon, cream, honey, chocolate, butter chicken, onion, fruits, nuts…). And usually they sell only half of a bread. Price is also more expensive than in France curiously. Now bakeries also work at different pace. In France, they open at 7/8am until 8pm usually. Here it’s more 9/10am to 10pm. 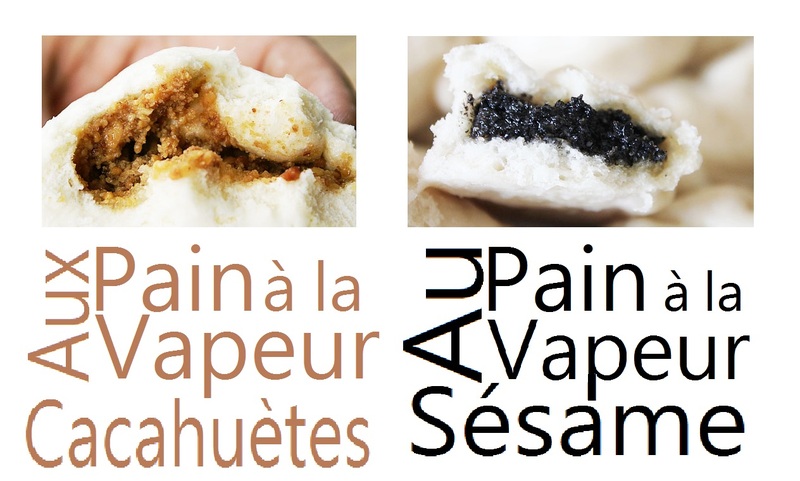 In the end, Taiwanese bread and French bread don’t have anything in common, so i don’t know why they love to put “french bread style” or french everywhere while actually it doesn’t even exist in France. Just like French fries. Why French? We’re not even sure that’s French! (even if we don’t really know yet from where it’s from). For French people, fries come from Belgium not France. But that’s another subject. Anyway, i tried several Taiwanese breads for a few weeks, including pumkpin bread, nut and cheese bread, and this one, the mix nuts bread. It had peanuts, walnuts, almonds, pumkin seeds, sesamy, dried grape and some other seeds that i don’t know. It’s pretty good compared to what i thought, and even though the bread is not crispy, the nuts make it crunchy. My 2 favorite steamed bread. Sweet, not salty, of course since i’m a sweet tooth. The peanut ones is crushed peanuts, a little bit sweet like peanut butter but you can really feel the peanuts under your teeth. I like it because it contrasts the blandness of the bread and also the soft/crispy texture is really nice. The second one is the sesame steamed bread. Less crispy and sweet, you can still feel the small seeds under your teeth, and the black and white color is also very nice. One bread that i found strange at first (and that is not a bread but a bun) is this melon bread. It looks to me like a pineapple, don’t ask me why, so melon was really a weird name for me. The surface is basically made with butter. I’m not really fond of this one because their bun are usually really fat, but dry and the same time, i mean they don’t have the real butter flavor. But you can find this one in every bakeries in Taiwan, it’s a classic. 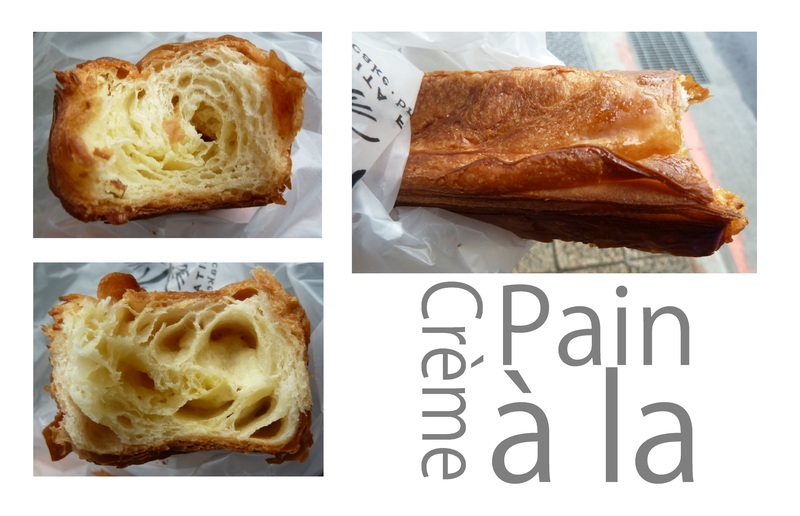 If the Taiwanese have not created the “Pain au Chocolat”, at least they thought about something as good, if not better: a longer and thiner puff dough filled with pastry cream instead of chocolate! If that’s not genius! I love it. New products at Lalos, so i tried (you know me, i never take the same thing twice). Tea bread….i’m really not convinced by this one. I personally think that it lacks salt. The tea flavor is really strong, so if you like tea, it’s ok, but i think it’s pretty hard to eat it with anything because the flavor is a way too strong to go with anything else.So either way you eat it alone, or you can try with sweet things like jam maybe, but i never eat jam, so i can’t really say if it’d be nice. Fig and Honey bread is better though. Better than the fig milkbread and tastier than the honey bread. A good one! I also saw thet they released a new “chausson aux pommes” (apple turnover) but with banana filling. After trying all their cakes (marble, orange, banana, fruits), and most of their breads (ciabatta, ciabatta with olives, seaweed ciabatta, olive oil ciabatta, ciabatta with herbs, garlic bread, cheese bread, bacon bread, longuet, ficelle, baguette, cramberry bread, grape bread, whole bread, cereal bread,…and i think that’s all for breads) , the bakery is developping new ones, so i can have some fun! And ruin myself even more! This week, they created the onion bread. Hum, mine was too cooked so it spoiled the onion flavor a little, but it smelled damned good. I would also add more onion to stronger the flavor, but i love onion in general, so that might also explain why it’s not string enough for me. Another one was the soft cristallized lemon bread. What i loved is that there was real lemon inside, which gave a really ince flavor. However the bread was a little too soft (you can’t cut properly it it you don’t have a bread knife), but i know that Taiwanese people prefer soft bread, so the company has to adapt itself to their taste. I also tried a Pain au chocolat: really nice. The chocolate taste is here, with the 2 stripes, and the pastry puff is crumbly, but not too much, so that you don’t loose your “pain” in crumbs and end up eating only half of it. However the croissant was not as good as the pain au chocolat. The pastry puff is a little too compact and not melting enough (but i guess this has to do with the butter). So if you have the choice between the two, i would recommand the pain au chocolat over the croissant. They also improved their honey bread, making a soft version of it for Taiwanese (since they don’t seem to enjoy real bread). If you have foie gras, the best choice is the Cramberries bread, very good with a nice sweet taste which matches perfectly with it. Each week you have special offer: last week, with their new honey bread, you had a slice of their banana cake, this week you have a discount if you buy the onion bread. When was the Frog last meal?